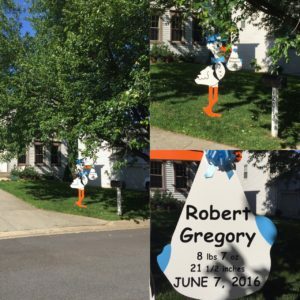 Flying Storks Maryland Stork Signs are about the price of flowers, but the memory lives on…. 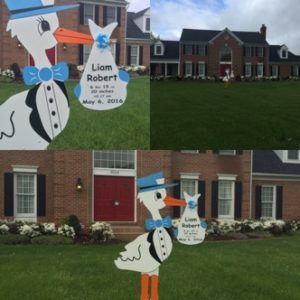 Delivers the Cutest Birth Announcements and our 6′ Stork Signs come with a personalized bundle for new family to keep. Call to day and surprise your loved one, colleague, friend or neighbor with this memorable gift! Surprise your loved one with this memorable gift! Call us at (301) 606-3091 for additional information or to order your stork today! Please visit our FB Page to see our most current rentals. Please follow us on Pinterest or Instagram and we will gladly return the favor and follow you or your business too. The stork she used was amazing, my daughter loved it. I definitely recommend Flying Storks!! !